Rand McNally, the venerable American company that has been helping families find their way for more than a century, just introduced a series of innovative games and activities to keep kids entertained and families connected in the car. The Boredom Breakers™ line is a refreshing alternative to portable DVD players and handheld video games many families use to pass time on long road trips or while shuffling around town. The products are designed to bring families together, encouraging conversation, laughter and fun making the miles fly by for moms and kids on the go. Rand McNally sent me one of the Car Game Countdown games. 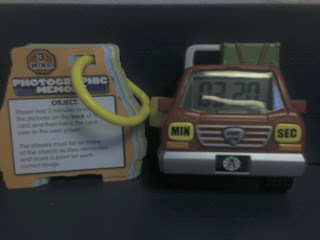 My favorite part is the car shaped timer. (In fact, Munchie just took off with it and keeps pushing buttons!) The countdown games are on a plastic ring for easy flipping through. Some were familiar games: License Plate Bingo sounds a lot like what we called "Alphabet Game". Each player tries to find the letters in order. We played this across 43 states growing up! 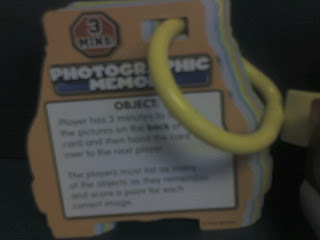 Some of the games don't require reading (like who can hold a pose for the longest or who can count the most red cars). 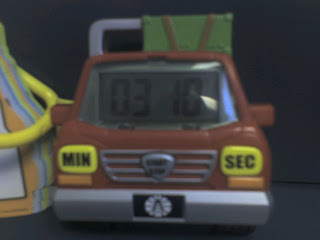 One thing I really liked about the games is the timer. (Yeah, I know I already told you I liked the timer, but this time I am talking about time limits!) I like the idea of playing a game for 30 seconds or 10 minutes. (A definite beginning and ending).